Sweet and adorable, too! If you plan on getting married, may I suggest doing something like this? 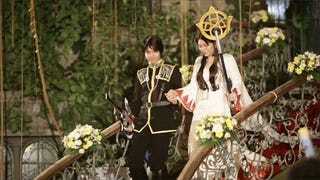 While the bride and groom dressed as Final Fantasy characters White Mage and Squall, those attending the wedding were encouraged to dress as their favorite characters—Final Fantasy or not. "Not all guests and relatives know Final Fantasy so we let them choose their own favorite characters instead," writes YouTuber JeanBilius, who added, "Hubby doesn't like Rinoa. He prefers White Mages and Yuna." Looks like it was a great wedding.